This entry was posted in Uncategorized on March 10, 2019 by Tim Tolson. Bring in old family photos from the 1880s to the 1950s for a free appraisal. Learn how to preserve your photos (free archival materials provided). 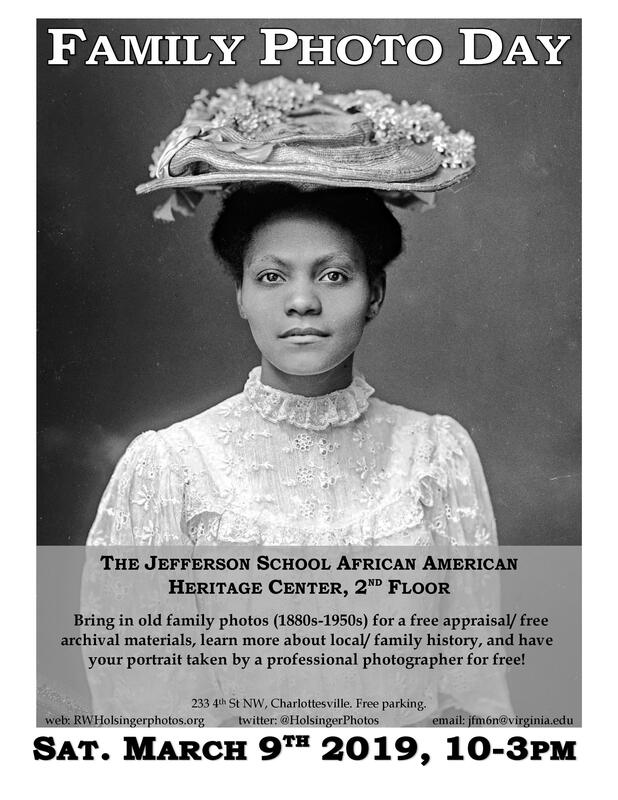 The Jefferson School African American Heritage Center is located on the Second floor of the Jefferson School City Center. Its main entrance is on Commerce St, one-block north of West Main Street. It can also be entered from the City Center’s 4th Street entrance. Over 200 free parking spaces on 4th Street. This entry was posted in EVENTS, News on February 12, 2019 by Tim Tolson. On July 8th at 8 am, as many as 110 people will “get on the bus” to begin the Community Civil Rights Pilgrimage. Their ultimate goal is to bring soil collected from the site where John Henry James was lynched in 1898, to the newly opened Equal Justice Initiative’s Monument to Peace and Justice in Montgomery, Al. We hope to deliver our soil on July 12th–the 120th anniversary of Mr. James’ murder. Along the way we will make stops to some of the most important civil rights sites in the country. On the bus will be students, teachers, and other community members as well as historians to provide information as we move from one site to another. We will also be accompanied by clergy and therapists to help us process during difficult moments. The trip dates are July 8 – 13, 2018. Total cost for this five night/six day all-inclusive excursion is $1,500. Hotel rooms are double occupancy and a per diem and cost of hotel is included in the price. A 50% deposit is needed to hold your spot. Checks should be made to the Jefferson School African American Heritage Center with a notation Civil Rights Pilgrimage. Our mailing address is 233 4th St, NW Charlottesville, VA 22903. If you earn below $47,000 per year then you are eligible to register as a low income member of our community for the pilgrimage. We presently have 30 slots available and will fill them on a first come, first serve basis. To register as a low income community member, you must provide a W2 form or two pay stubs as proof. If you do not have this information, please contact us anyway. Please send this information to memorialtolynching@gmail.com with your name address and a method of contacting you. If you are a household, we will need the names of all members who would like to attend. This entry was posted in Uncategorized on May 21, 2018 by Tim Tolson. Do you believe in the promise of Brown v. Board? It’s a simple question, but one that several of President Trump’s judicial nominees have struggled to answer. We need your help to make sure that those who don’t believe in civil rights don’t get to guard our justice system. Brown v. Board was a critical civil rights milestone but its full progressive potential has not been realized. Many children of color remain relegated tounderperforming schools, and, as recent incidents have shown, racial bias remains a daily reality. Now, we find ourselves faced with judicial nominees who refuse to state their support for Brown v. Board. Six of Trump’s selections for these lifetime appointments to federal courts evaded senators’ questions about their feelings toward the Supreme Court decision. Such behavior is hardly surprising from nominees with proven track records of disrespecting the rights of Americans of color. These individuals have worked to roll back voting rights, criminal justice, immigrant rights, and LGBTQ rights. Many would join all-white courts in jurisdictions serving millions of people of color. Our democracy needs your help. With nearly 180 judicial vacancies, the Senate’s action on these nominees could impede progressive issues for decades. Please urge your senators to confirm qualified, honorable candidates. Protect our courts and the promise of Brown v. Board. This entry was posted in Uncategorized on May 19, 2018 by Tim Tolson. On Monday, October 9, 2017 at the Jefferson School City Center, 233 4th Street NW, Charlottesville, in the Mary Williams Center on the first floor adjacent to the Vinegar Hill Cafe, the Albemarle-Charlottesville Branch of the NAACP meet. Before the business meeting, we discussed Racial and ethnic disparities in health status, lead by Dr. M. Norman Oliver, researcher, teacher, and clinician. This entry was posted in Uncategorized on October 18, 2017 by Tim Tolson. On behalf of the Albemarle- Charlottesville NAACP officers and members, we are pleased to have you join us for our annual Freedom Fund Banquet. We hope that your evening is pleasant and enjoyable. January 2017 saw a changing of the guard for the Albemarle-Charlottesville Branch of the NAACP. After twelve years of dedicated service to the organization, Dr. M. Rick Turner made the decision to resign from his position as president of the local branch. We thank him for his twelve years of service and we will continue to build on the progress made during his tenure – while encouraging a productive vision for the future of the branch. For over a century the NAACP has been one of the nation’s leading champions of civil rights and social justice; working tirelessly to achieve economic equity, with a commitment to attain equality and justice for all. Dr. King once said,” the arc of the moral universe is long but, it bends towards justice.” Justice, a word that has continued to surface in daily conversations, is being enacted by various vocal means of protests throughout the nation. Just this year members of the Albemarle-Charlottesville Community braced themselves while preparing for visits from members of the Ku Klux Klan and – the organizers of the Unite the Right Rally resulted in a tragic ending involving the loss of life. The Albemarle-Charlottesville NAACP countered the Klan rally with a successful peaceful protest rally based on the theme, “Steadfast and Immovable”. Various other community activities were planned to provide alternative choices in lieu of attending the rallies. The NAACP stands at a pivotal time in history! We find ourselves in a period of unrest as a nation. We seem to be engaged in a struggle to protect the gains that we as a people have made during the last fifty years, especially the right to vote. The NAACP stands ready to challenge efforts to roll back and eliminate policies and programs intended to extend the social safety net to all. Many people in our community and across America would be affected by this injustice. Therefore, the tireless work of the NAACP remains relevant today. As the oldest civil rights organization in the world, we would want to be a significant part of the solution as we remain dedicated and committed to the mission of the organization: to ensure the Political, Educational, Social and Economic Equality of Rights of All Persons and to Eliminate Racial Hatred and Racial Discrimination. We remain steadfast in our resolve and immovable from our objective. This entry was posted in News on October 8, 2017 by Tim Tolson. This entry was posted in News on September 10, 2017 by Tim Tolson. Affordable Housing Meetings Coming Up – Please Attend! Show up to show you care! These meetings, also called “charettes” will bring together the community and consultants who are working on part of the plans for the Strategic Investment Area (SIA). They need to see community members and their supporters to understand how important affordable housing is, especially for people making $30,000 or less. For more info. See the Charlottesville Low-Income Housing Coalition website: https://affordablehousingcville.org/. Please mark your calendar, hope to see you Tuesday! Monday, August 14, 2017 In lieu of our regular meeting and in partnership with the Jefferson-Madision Regional Library, the film "13th" will be shown on Monday, August 14, 2017 from 6:30 – 8:30 at the Central Library – 201 E. Market St.
"13th" is a Netflix original documentary. Filmmaker, Ava DuVernay, explores the history of racial inequality in the United States – focusing on the fact that the nations prisons are disproportionately filled with African-Americans. The documentary was done in 2016 and lasts 100 minutes. This event is free and open to the public. This entry was posted in News on August 16, 2017 by Tim Tolson. Dr. M. Rick Turner, Immediate Past President of the Albemarle-Charlottesville NAACP will speak on Pipeline to Prison at the Democrats Breakfast meeting on August 19 at 9:00 A.M. at the JMRL Central Library at 225 Market Street. This entry was posted in News on August 14, 2017 by Tim Tolson.